Adults are much less likely than teens to have a profile on a social network website. About three in ten (35%) adult internet users age 18 and older have a profile on a social networking site like MySpace, Facebook or LinkedIn. Meanwhile, teenagers are roughly twice as likely as adults to use these sites: among teens 12 to 17 years old, 65% have a profile on an online social network.9 Despite comparatively lower levels of social network use, usage of social network sites by adults has increased markedly over the past four years. 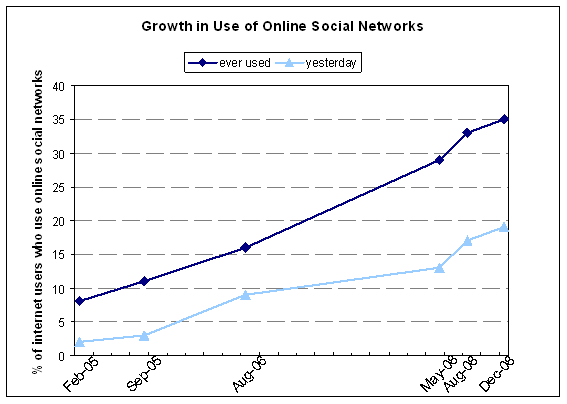 Back in February of 2005, just 8% of adult internet users had used a social network site. That percentage had risen to 16% by August of 2006, and as of December 2008 stands at 35% of online adults. The use of social networks on any given day is also on the rise. In February 2005, just 2% of adult internet users had visited an online social network “yesterday” while 19% of adult internet users had done so in December 2008. Social network users10 are equally likely to be men and women, and are also more likely to be young: 75% of online adults between ages 18 and 24 have a social network profile, as do 57% of wired adults between 25 and 34. Profile ownership drops to 30% among 35-44 year olds, 19% among 45-54 year olds, 10% among 55 to 64 year olds and 7% of online adults 65 and older. Similarly, social network users are also more likely to be students — 68% of full time students and 71% of part-time students have a social network profile, while just 28% of adults who are not students use social networks. Whites are less likely than African-Americans or Hispanics to have a profile on an online social network. Nearly one third 31% of online white adults have a social networking profile, compared with 43% of African-Americans and 48% of Hispanics. Half of social network users have profiles on MySpace. Among adults, MySpace is the most popular online social network.11 Half (50%) of adult social network users age 18 and older are on MySpace, while 22% of adult social network users have an account on Facebook. Another 6% have an account on LinkedIn, 2% have an account on Yahoo, and 1% each have accounts on YouTube and Classmates.com. Another aggregate 10% of adult online social network users have profiles on other sites, including BlackPlanet, Orkut, Hi5 and Match.com. There is some variation in the types of people who tend to use each of the top three social networks. Typically, MySpace users are more likely to be women, Hispanic or black, to have a high school education or some experience with college. The median age of a MySpace user is 27 years old. Facebook users are more likely to be men and to have a college degree. The median age of a Facebook user is 26 years old. 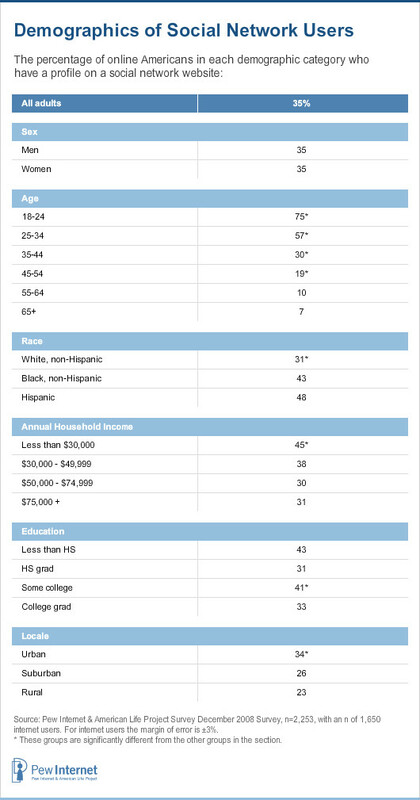 LinkedIn users are more likely to be men, to be white and to have a college degree. The median age of a LinkedIn user is 40 years old. Personal use of social networks is more prevalent than professional use. Overall, adults tend to use social networks for personal reasons more than professional ones. This is true of both the networks that adults choose to use, as well as the reasons they give for using these applications. As noted above, 6% use LinkedIn, an online social network dedicated to professional networking, while 72% use other social networks (MySpace and Facebook) that are used for both professional and personal networking purposes. In addition, most adults use online social networks primarily to connect with friends. Nearly nine in ten social network users (89%) say they use the networks to stay in touch with friends, and 57% say they use it to make plans with friends. 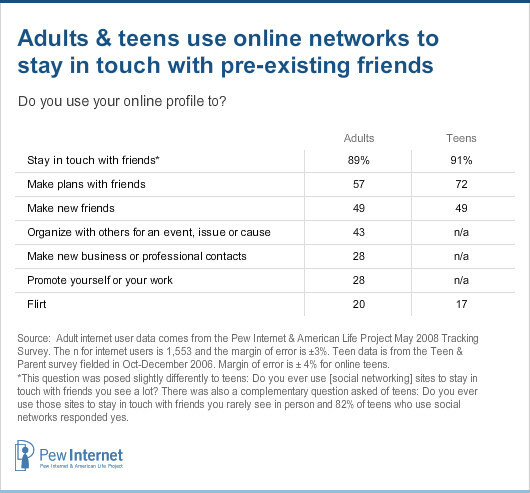 As with teens, the bulk of these friend connections are with people they already know; under half (49%) use the sites to make new friends. Professional uses are less prevalent; less than a third of social network users are using them for professional purposes, regardless of which site they use. Facebook and MySpace users are similarly focused on personal uses for their online profiles. 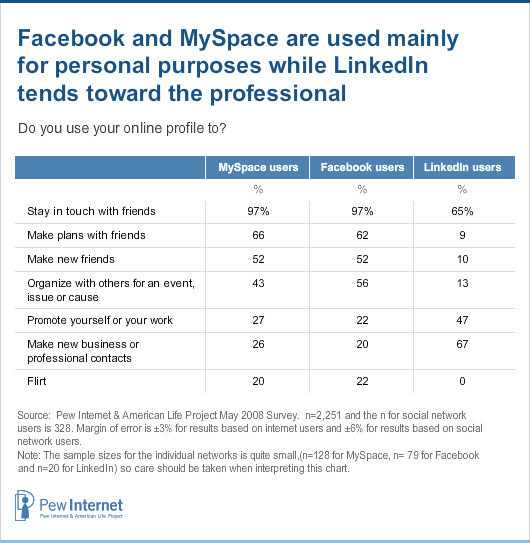 LinkedIn users are much less likely to say they use the site for personal reasons and much more likely than MySpace or Facebook users to say they use it for professional ones. More than one third of social network users visit their profile daily. Among social network users, more than one third (37%) visit their profile daily.12 Another quarter (23%) visit every few days and 15% view their most visited profile once a week. One quarter of social network users (23%) visit their profile less often than once a week. 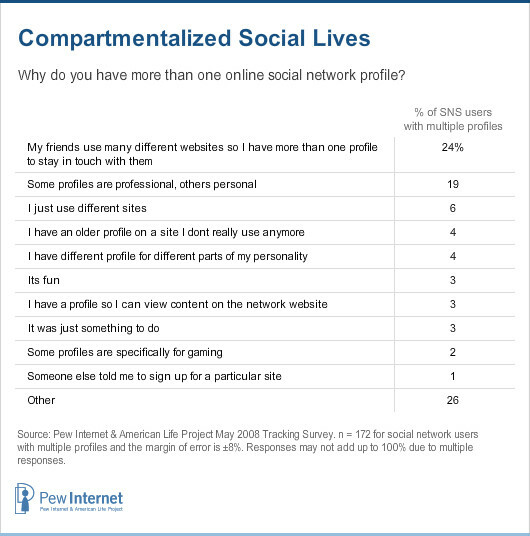 More than half of adult social network users have more than one profile online. The average social network user has more than one profile, and generally each profile resides on a different social network. 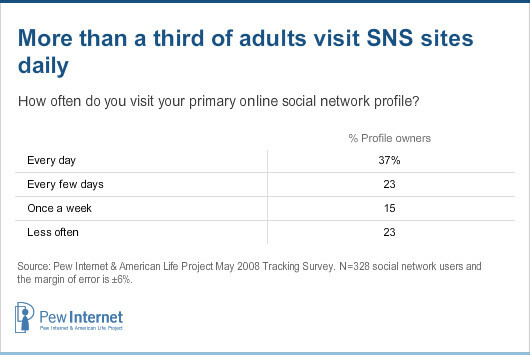 About two in five (43%) adult social network users have one profile online. Another quarter of adult social network users (25%) have two profiles online, 12% have three profiles online and 13% have four or more online profiles. Taken together, this means that 51% of social network users have two or more profiles online. Men are more likely than women to have two or more online profiles (54% vs. 47%). Social network users under the age of 45 are more likely to have multiple profiles than users 45 and older. Those with multiple profiles use them to compartmentalize their lives and stay in touch with friends. For those users who do have multiple profiles, the vast majority (83%) have those profiles on different sites –in other words, users tend to maintain multiple profiles on different networks, rather than multiple identities on the same network. When asked why they maintain multiple profiles, one quarter (25%) of users with multiple profiles say that having multiple profiles helps them to compartmentalize their lives. For instance, 19% say some profiles are professional, others are personal, 4% say they have different profiles for different parts of their personality and 2% say at least one of their profiles is specifically for gaming. But mostly, users have multiple profiles to better keep track of their friends who may be spread across multiple sites. About a quarter (24%) of users with multiple profiles give this as a reason for having more than one profile online. Others have all but abandoned older profiles because of technological advancements or difficulties – moving from an older legacy site (4%) to a newer or different social network site. In many cases, these older profiles are little used, but not necessarily deleted. One in ten internet users have deleted an online profile. 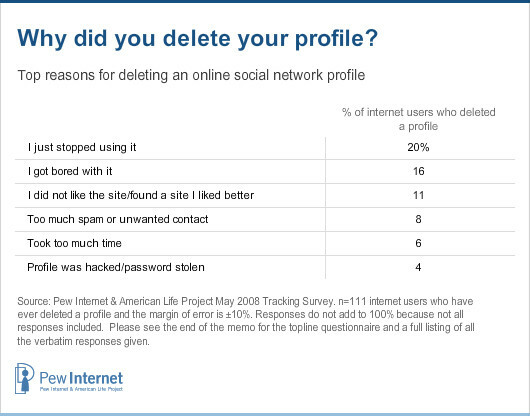 One in ten (10%) internet users have previously had a profile on a social network site but have deleted it. Among current social network users 28% have deleted a profile, while 17% of those who have deleted a profile are no longer using social networks at all. When asked why they deleted the profile, adults gave a wide range of reasons. The largest percentage of users (20%) said that they simply stopped using the profile prior to deletion. Others reported boredom with the profile (16%), dissatisfaction with the social network site (11%) or that the profile was too time-consuming to maintain (6%). Others had more negative experiences, citing too much spam or unwanted contact (8%) or a stolen password or hacked profile (4%) as their reasons for deleting an online social network profile. There were few differences between current profile owners who had deleted a profile and those users who no longer use social networks in the reasons they gave for deleting their profiles. Nearly two-thirds of adults restrict access to their online profiles and a similar percentage restrict access to specific content within their profile. American parents and policy makers have spent a good deal of time recently telling youth to be careful online. They have exhorted teens, particularly young women, to keep personally identifiable information safe and private and Pew Internet surveys have found that many teens are responding to those cautionary words.14 Adults, however, are free to share or not share their personal information as they choose, and in this survey 60% of adults restrict access to their online social network profiles so that only their friends can see the content, while 36% of adults allow anyone to view their online profiles. Facebook users are the most likely to restrict access to their profile, with 79% of them restricting access to their profile so that only their friends can see it. Among MySpace users, 63% have their profiles visible only to their friends, and 55% of LinkedIn users report similar restrictions. Nearly six in ten (58%) adult social network users limit who can see certain information on their profiles, like photos or wall posts, while 39% of adults do not restrict access to certain content on their profiles. Some of these choices will be determined or limited by the tools provided (or not) by the social network the individual uses. Still, there are fewer differences between the users of different networks in their likelihood of restricting access to specific pieces of content on their profile than in general profile privacy restrictions mentioned above. A large percentage of profile-owning adults (43%) acknowledge the public nature of their online information and say that it would be pretty easy to find out who they are from their online profile. Another third (33%) think that someone would have to work at it, but could eventually figure out who they are from their profile. Only 20% of adult social network users say it would be very difficult for someone to find out who they are from their social network profile. These findings highlight the tension inherent in social network use. A user generally wants to be findable by the people they wish to add to their online network – offline friends, family, contacts and co-workers – but may not wish to be so visible as to be harassed or observed by people totally unknown to them. 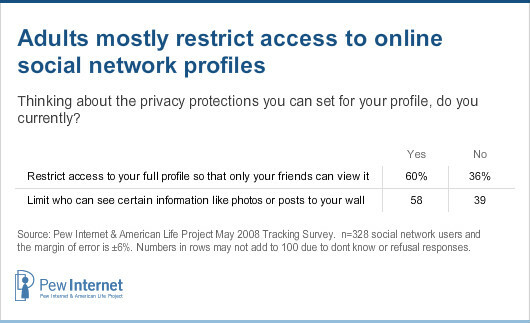 Compared with teens, adults are much more likely to say that they are open and public with their profile information. 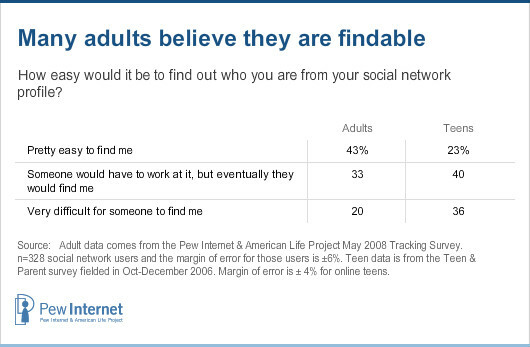 Teens are more likely to say that it would be harder to find them from their profile; 43% of adults believe it would be pretty easy to “be found” online, compared with just 23% of teens. During the presidential campaign, online social network sites were used for political information seeking, declarations and organization. 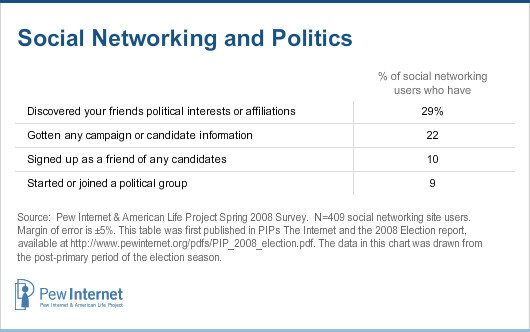 For a more elaborate discussion of these findings on social networks and politics, please see our report The Internet and the 2008 Election at https://www.pewinternet.org/pdfs/PIP_2008_election.pdf, starting on page 10.